It’s perfect for bringing to family gatherings or New Year’s Eve dinners because it feels festive and tastes delicious. At the same time, it’s low in acid and full of healthy vitamins and minerals.Today, I want to share a recipe we’ll be preparing for our Christmas dinner. No one has to know how easy it is to make! Just be sure to double or triple the recipe depending on the size of your party. As I’ve mentioned, that’s one of our favorite ways to keep an alkaline diet during the holidays. So even if most of the holiday spread is bursting with acidic foods like ham or turkey, stuffing, and mashed potatoes loaded with butter and cream, not to mention the desserts, you’ll have an enjoyable alternative that’s really filling. Plus, you never know… You might inspire your family and friends to make healthier choices in the new year once they taste how good these are! 16 large Brussels Sprouts, leaves separated from the core. Cut the end of the sprout off and peel leaves off. Heat oil in a large wok or skillet over medium-high heat. Add pistachios and lemon zest and sauté for one minute. 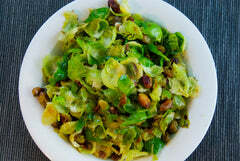 Add Brussels leaves and toss until bright green but still crisp, about 5 minutes. 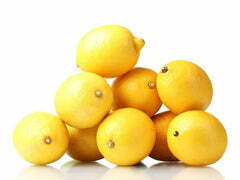 Squeeze lemon juice over the leaves and season with salt and pepper.